I absolutely loved The Reader, and I had high hopes for The Speaker. I loved all of the characters and I especially loved how there were many different stories going on at once in the first novel. It was so brilliant that I wasn't sure how Traci Chee could write a second novel to top it, but she exceeded my expectations and grew the characters that I loved into so much more. The quiet but dangerous Archer turned into a force to be reckoned with, and Sefia was strong, capable, and everything I ever hoped she would be. We learned so much more about all of the characters, and I loved getting a small glimpse into their lives before they all came together. There was constant action and adventure as well as a fair amount of romance and drama. I loved the mixture of rough action with soft and tender moments between Archer and Sefia. There were moments of loss, moments of gain, as well as a few moments that made the reader question the motives of characters. I thoroughly enjoyed the twist at the end of the novel and look forward to where Chee will take us in the next installment. I am a HUGE fan of this series and highly recommend it if you are a fan of YA fantasy novels. 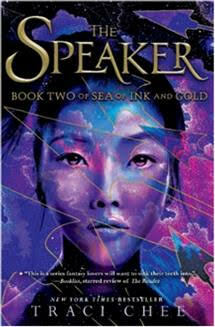 Thank you to Penguin Teen for sending a copy of The Speaker in exchange for an honest review.